Such a welcome visitor and so pretty. Oh, that's a gorgeous butterfly. 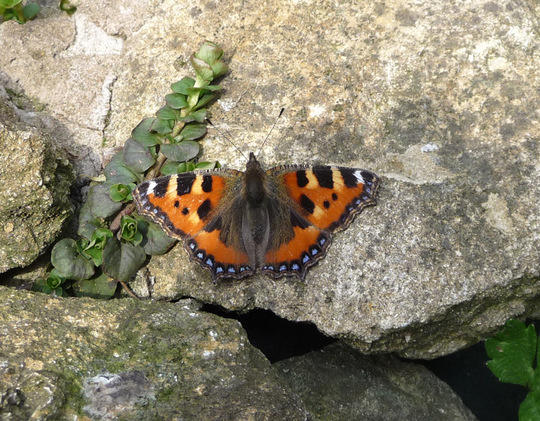 I haven't seen a tortoiseshell for years! thanks! Beautiful... I love their turquoise scalloped edging. Oh you are lucky lovely photo, I seen a cabbage white here the other day not one of these yet though, interesting how different part of the country get them at different times. The weather has certainly brought them out this week. Lovely photo. Overcast and chilly here today so nice to see. saw a brimstone yesterday. would ove to know where they hibernate. Gosh that is early, we had the comma, the brimstone and the peacock, lovely photo BB. Great to see them so early Dottydaisy..must have been hibernating close by ! Ah! the tortoiseshell! Another great pic.